Are you an uninsured Wayne County Resident, looking for a Free Health Expo? Are you shopping for a low cost insurance plan or interested in learning about services offers by local helping organizations? 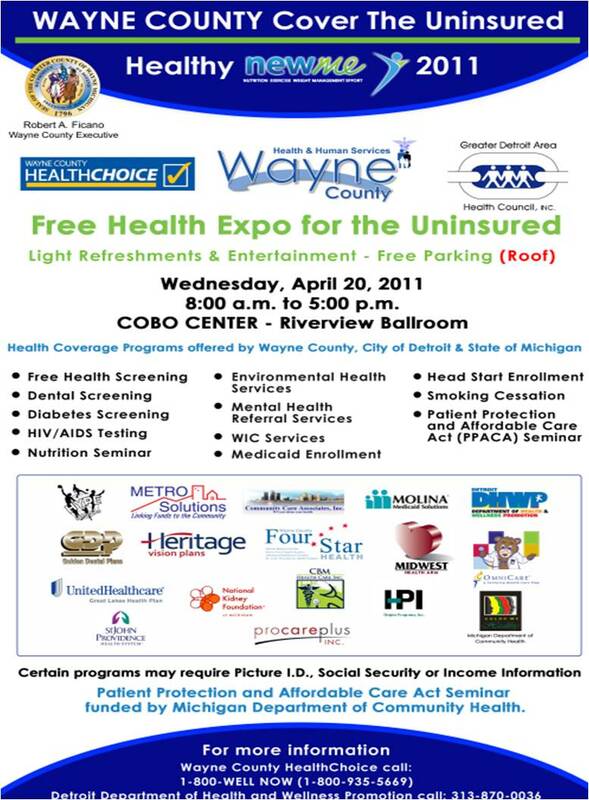 Then the Wayne County Cover The Uninsured Free Health Expo is the place for you. Services available are: Free Health Screening, Diabetes Screening, Mental Health Referral Services, Dental Screening, Free HIV/AIDS-STD Testing, Nutrition Seminar, WIC Services, and more. There will even be a seminar regarding the Patient Protection and Affordable Care Act (PPACA). You can also apply for Medicaid enrollment and learn more about health coverage programs offered by Wayne County, City of Detroit, and the State of Michigan. Insurance companies will be onsite to answer questions you have about affordable plans. Some programs may require Picture ID, Social Security or Income Information. Not in the Wayne County, MI area? Find a public health center close to you, many offer similar services and programs.